Our wigs for women include options for all ethnicities, textures, and color palettes. Find a wig made of real human hair or synthetic material, heat friendly or pre-styled. With all the things you have to worry about, a bad hair day shouldn’t be one of them. We aim to empower you with options for high quality, dependably stylish women's wigs so that you can spend your time and energy elsewhere - feeling great and looking fabulous. At Headcovers, we offer four main types of wigs for women: synthetic, heat-friendly synthetic, human hair, and remy-human hair. The material of your wig affects how you can style it, as well as the price, care instructions, and lifespan of the product. While synthetic is easier to maintain, real hair offers coverage that is virtually indistinguishable to the wearer as well as the observer. In other words, it feels just as authentic as it looks. Human hair wigs and heat-friendly synthetic hair are beloved by women for their flexibility when it comes to styling. These wigs can withstand heat tools so you can curl or straighten to your heart’s content. But if that’s not a priority for you - if, in fact, you’d rather your wig maintained its predetermined shape forever - then opt for a basic synthetic. Thanks to technology today, synthetics have a super realistic appearance, too. See our Synthetic vs. Human Hair cheat sheet to learn more. And remember that at Headcovers we take pride in vetting each and every female wig for top notch quality. So really, it’s hard to go wrong. What is a Cap Type and Why Does it Matter? If this is your first time buying a wig, there’s going to be some terminology you’re unfamiliar with, and we’re guessing that “cap type” might fit that bill. Allow us to explain. The cap of a wig is basically the headpiece that the hair is attached to. At Headcovers, our women’s wigs for sale fall into four categories - classic, monofilament, lace front, or hand tied. Generally, wigs for women get more expensive as you progress through that list due to how intricate the hair attachment method is. For example, constructing a hand tied wig involves knotting each individual hair to the cap, by hand, to achieve the most realistic-looking movement and drape. Learn more about Different Types of Wigs to find out which cap type will be best for your budget and aesthetic needs. We offer four ways to match your target color when buying a wig online. First, if you happen to have a lock of your natural hair, send us a swatch in the mail. Our expert cosmetologist will match the shade to whichever wig you’ve ordered. Another option is to email us a photo of your natural hair so that we can contact you with our recommendations. If, on the other hand, you are a seasoned wig wearer and know exactly which shade to request, that works too - just let us know. Finally, for those who favor a human touch, our women's wig consultants are available over the phone to walk you through the color matching process at 1-800-264-HATS (4287). We understand that comfort is paramount. If your scalp is extra sensitive, just the thought of putting something on your head may be enough to make you cringe. So at Headcovers, we’ve got options. Our double monofilament and 100% hand tied wigs are our softest women’s wigs for sale, and will be less scratchy than classic wig constructions. If that’s not enough, try layering our Cushion Band Gel Headband underneath. This handy dandy accessory is like a mattress pad for your head, making sure that the weight of the wig is evenly distributed by providing a cool padding to protect your skin from scratches or sores. But many women find that just wearing a wig cap is enough. These act as a barrier between your head and the wig. We’ve got them in materials like cotton, bamboo, and even aloe, to provide silky, breathable solutions to wig discomfort. Which Wig Length Should I Choose? Choosing a flattering female wig is similar to deciding upon a haircut. First and foremost, choose a length that you like. What’s going to make you happiest when you look in the mirror? That should be your guiding light. But if you want to get technical, here’s our technique: we know that the most flattering wigs for women help the face achieve an ovular appearance. For example, if your face is round, a shoulder length cut will help balance things out. Heart shaped faces should be framed by hair at least chin length or longer, and square faces look nice with layered fringe to soften any angles. If your face is already long, then a short haircut can help even things out. For more details, read through our Wig Hairstyle Guide for Different Face Shapes. While timing isn’t everything (you can buy a wig any darn time you want), having a wig picked and ready to go before chemotherapy starts can help with the transition as your hair begins to fall out. Be sure to talk to your doctor about what type of hair loss to expect so you can plan for the physical changes that are to come. If total loss is in the cards, we recommend buying a wig early. After chemo starts, it can take just a couple of treatments before you’ll notice its effects on your hair. Many women find that having a wig waiting in the wings can dull the anxiety and mitigate the trauma of dealing with yet another physical sign of cancer. Will Insurance Pay for My Wig? Many insurance companies will pay for a women's wig that is needed for medical reasons. However, getting it covered is all about terminology. Be sure to ask your insurance company if they cover “cranial prosthesis” (insurance jargon for “wig”). If they do, we’ll provide you with a special receipt to submit with your claim. In the past, our customers have been able to get their cranial- er, wigs, reimbursed with no issues. Learn more here. Texture is key when it comes to finding a wig that helps women cope with hair loss. So if you’re hoping for a substitute ‘do that looks and feels like your own, browse our wigs curated especially for black women. Our African American women’s wigs for sale tend to have a thicker texture and come in a darker range of colors. We sell wigs from Vivica Fox, a company that uses the hottest technology to bring you functional and highly fashionable wigs. Choose a heat friendly style if you want to curl and straighten your locks into a particular ‘do. And don’t forget to reach out if you’d like assistance matching shades or textures to your natural hair. We’ve got baseball hats for short hair, chin length hair, medium length hair, and long hair, in a wide variety of shades so that you can match your natural hue exactly. Just pop it on and go - no extra styling necessary. Maybe a full wig isn’t what you’re looking for. At Headcovers, we understand that every woman experiences hair loss differently, so we’ve got options to meet you where you’re at. Consider wiglets your “in between” solution. Just clip one in and watch the bad hair day blues melt away. We offer women's wiglets in three main sizes - small, medium, or large - designed to cover three specific areas of the head - part/hairline coverage, top coverage, and crown coverage. The best way to get started is by measuring the thinning spot on your head to understand what size topper you may need. Take a soft measuring tape and measure at the widest points of the problem area. Then head over to our Hair Topper Style Chart to see our recommended selection of products based on the size and location of your patch. If you’ve got more questions, check out our Hair Toppers & Wiglets Resource, a comprehensive guide for purchasing a partial wig. Choosing a wig can be an intimidating task, but it’s certainly not something you have to do alone. If you’re looking for expert advice, we offer free style and color consultation on all of our women’s wigs for sale. If you have any questions, concerns, complaints, or musings, call us at 1-800-264-HATS (4287). 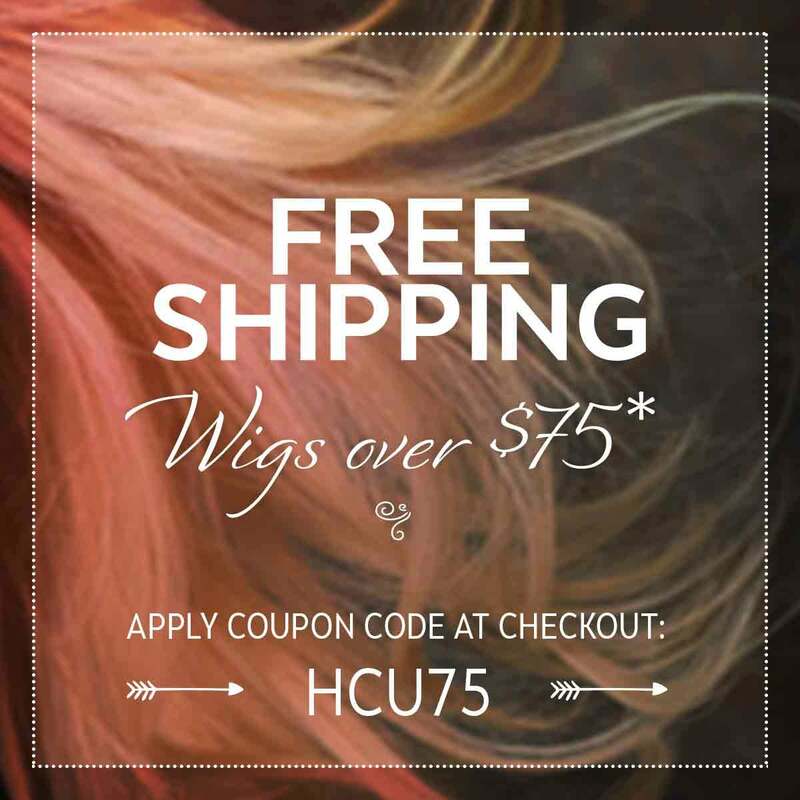 We’d love to support you on your quest to find the perfect women's wig.